Pinterest is a very strong social platform and I recommend everyone use it to network and promote their web sites and blogs. 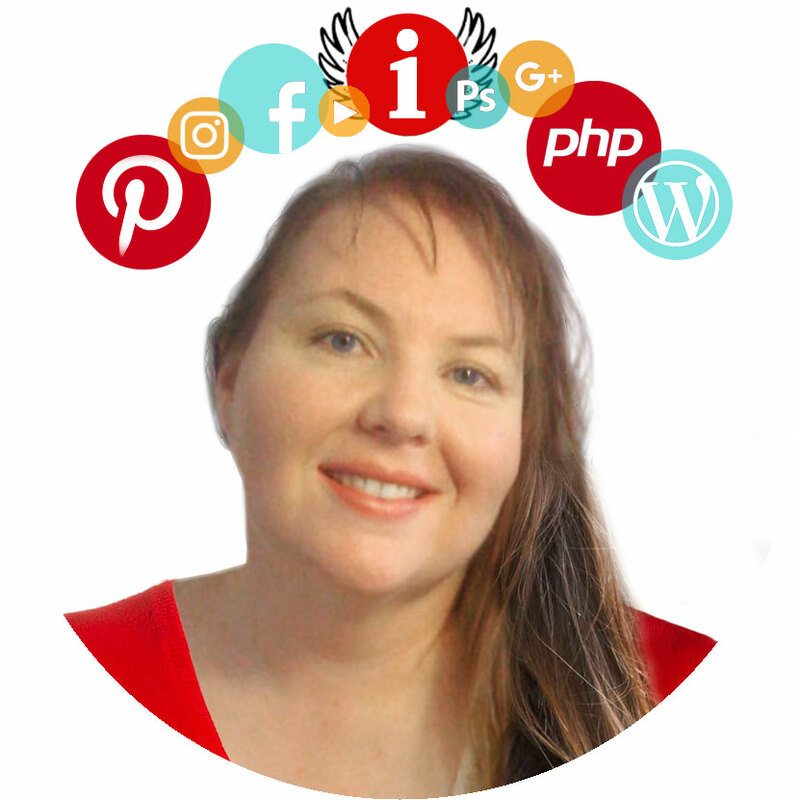 I’ve been using Pinterest for my business site since its early “waiting list” period many years ago and benefit greatly from it. My business Pinterest account has 5000 followers, all organically obtained with minimal effort. Recently I decided to start a brand new Pinterest account just for my personal blogs. This meant I started with exactly 0 Pinterest followers. So I decided to see how many Pinterest followers I could get when starting from scratch. Each day, I tried something new on Pinterest. 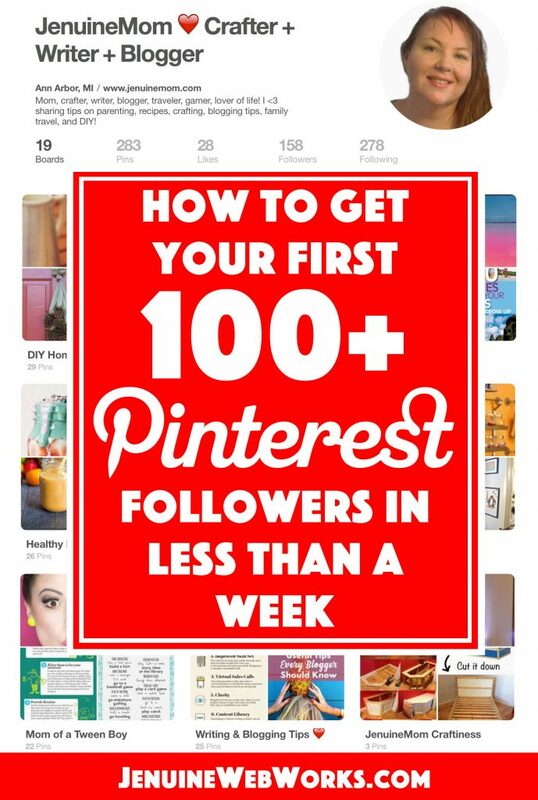 And within six days, I had my first 100+ Pinterest followers. Today I share my tips and tricks on how I gained my first 100+ Pinterest followers in less than a week. Pinterest recommends 20-30 pins per board to give your potential Pinterest followers a good idea of what each board will offer. I started with fewer pins per board than this. I had 5-10 pins per board and, in retrospect, I should have started with more pins. My Pinterest account at the end of day 1. Try-It-Yourself: Start with 5-7 boards with topics related to your web site or blog. For example, my new Pinterest account is for my JenuineMom.com blog, a “mommy blog” all about DIY crafts, home decor, recipes, and parenting. So I titled my first boards DIY Home Decor, Craft Tutorials, Family Travel Ideas, Healthy Recipes, Yummy Fun Food, DIY Home Organization, and Mom of a Tween Boy. How did I come up with these names? I started typing the main topic into the keyword search box on Pinterest to see what it suggested, and these were all popular searches (or similar to them. Easy peasy! Now fill them with pins — you want a mix of re-pins and pins from your own site (at least 80% pins from other sites). I found the pins I liked simplify searching Pinterest. That’s right, no one followed me on my first day because no one knew I was even on Pinterest — I focused on getting something ready to be seen first. Now that I had some boards, it was time to connect with other Pinterest users. I was ready to throw open the doors to my pin boards in the hopes of gaining Pinterest followers! So on day 2, I identified my target audience on Pinterest (other DIY crafters, moms, and happy nesters). I found some other Pinterest boards with related topics and followed those specific boards. Since I admired those boards, it stood to reason that the other followers of those boards might share my interests, so I also checked their Pinterest follower list and followed the boards of some of them as well! Try-It-Yourself: Use the Pinterest keyword search bar to look for keywords related to your website or blog. Find some pins you admire, then click to see who posted them. If you see some boards of theirs you like, follow them. Then click on their Followers list and check out their followers’ boards — if you like ’em, follow ’em! And don’t forget to keep pinning like you did on day 1 — aim for 15 to 20 new pins each day (again, mostly re-pins and/or pins from other sites, with 1 or 2 pins from your own site). Here’s that Facebook post about my new Pinterest account. Try-It-Yourself: Post to your social media network of choice to let your friends know about your new Pinterest account. Most people are happy to follow people they like on Pinterest! Don’t forget to include the link, too. Also post about your Pinterest account on your web site or blog! Letting your network know is one the best ways to get Pinterest followers when you’re new. Group boards on Pinterest often have large followings. When you join them and pin something to it, your pin can be seen by hundreds or even thousands of other Pinterest followers. This is a great way to get your pins and content seen by a bunch of people with like-minded pursuits, even when you’re new to Pinterest. There are two good ways to find Pinterest group boards — search at PinGroupie.com or join a Facebook group called Pinterest Group Boards to see which groups are actively looking for new members. I had the best success with the Facebook group and joined five Pinterest groups. 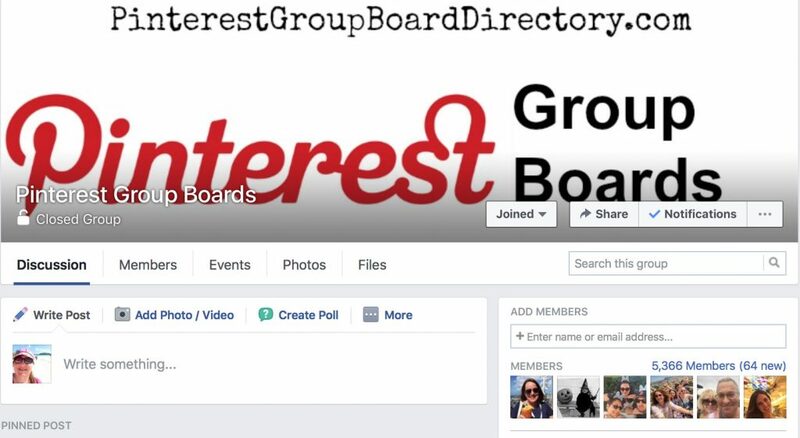 The Pinterest Group Boards group on Facebook is great for getting invitations to group boards! 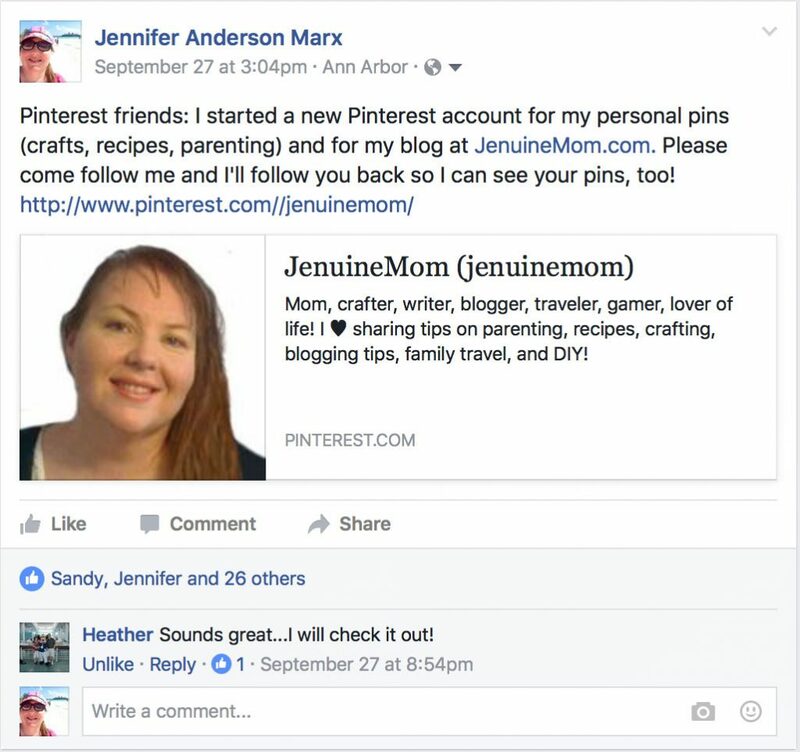 Try-It-Yourself: Ask to join the Pinterest Group Boards on Facebook (https://www.facebook.com/groups/pinterestboards/) and, when accepted, look for group boards that are relevant to your interests then ask for an invitation. Be sure to read and follow the directions on how many pins you can post and what type/format so you don’t get booted out. Update: Another great way to find group boards is to locate popular and active pinners in your niche and see what group boards they belong to! I’ve been reading a lot of advice on how important it is to follow the boards of people you like. But it turns out that if you want to get noticed and followed back, it’s better to follow them outright rather than just follow one or two of their boards. This tip applies only to the big influencers on Pinterest. Why does this work? It all goes back to day 2’s tip: following competitors’ followers. Because this tip is bandied about often online, there are others out there who are looking at the follower lists of big influencers and following them in the hopes of being followed back. I discovered this when I saw a Pinterest account pop up several times in the follower list of accs. When I checked that account’s actual list of followers, they had only 393 names on that list, and the names I saw the account following earlier were not there later. This tells me that account is following movers and shakers, and later unfollowing. Interesting, huh? Tread carefully here. Following, unfollowing, and following again is both tedious and a recipe for disaster. It can get you banned. Follow only those accounts you truly admire. Try-It-Yourself: Go back through your list of boards you’re following to see if you it might not be better to follow the entire account. Also check the list of top 100 most followed Pinterest accounts and look for kindred spirits who had similar interests to you, then follow them too! Another good place to check for influencers on Pinterest to follow is the following list of other influencers! My power went out today (ah, the joys of working from home) so I was relegated to working on my laptop and iPhone. The good news is that I can do mostly everything on the phone, as both Pinterest and WordPress have apps. So in addition to following the tips from the previous five days, I made sure I was repinning. I repinned the best pins from both my followers and those I was followers. Not only does this help me and my Pinterest boards, but it provides reasons for my followers to continue following me. It also strengthens the relationship between me and these other accounts, which is good for keeping your account healthy! Important Note: Pinterest can and does restrict certain behaviors on their site to keep it a safe and helpful place. I’ve heard of pinners being put in “time out” or even banned for commenting links on pins or for following too many people too fast. These should not be issues if you’re working on Pinterest 15-20 minutes a couple of times a day (which is what I’m doing), but something to keep in mind for anyone thinking about gaming the system. Try-It-Yourself: Now that you have a healthy list of accounts you’re following, your Pinterest feed should be full of interesting things to re-pin! Try to re-pin at least a dozen good things every day consistently! It won’t take more than a few minutes … a little longer if you’re really picky. Popular pinners repin existing pins on Pinterest that are also popular. The Pinterest accounts with the highest followers (above 4 million) seem to prefer vertical pins that are high-quality graphics only and no text at all. I also prefer vertical pins with high-quality graphics, but I also appreciate a text on my pins. So where do you find good quality content to pin on a regular basis? It’s highly unlikely you’re making all that content yourself each day. You need to find active sites and blogs you admire and respect, bookmark them, and visit daily. You can use blog aggregators like Bloglovin’ to save and display new blog posts, too. Try-It-Yourself: Sign up for Bloglovin’ (it’s free), search for blogs with interests similar to yours, and (if you like them) follow them. You’ll now see their new posts in your feed each time you visit. Just searching Bloglovin’ for new posts is a good way to find new content, even if you’re not following someone! 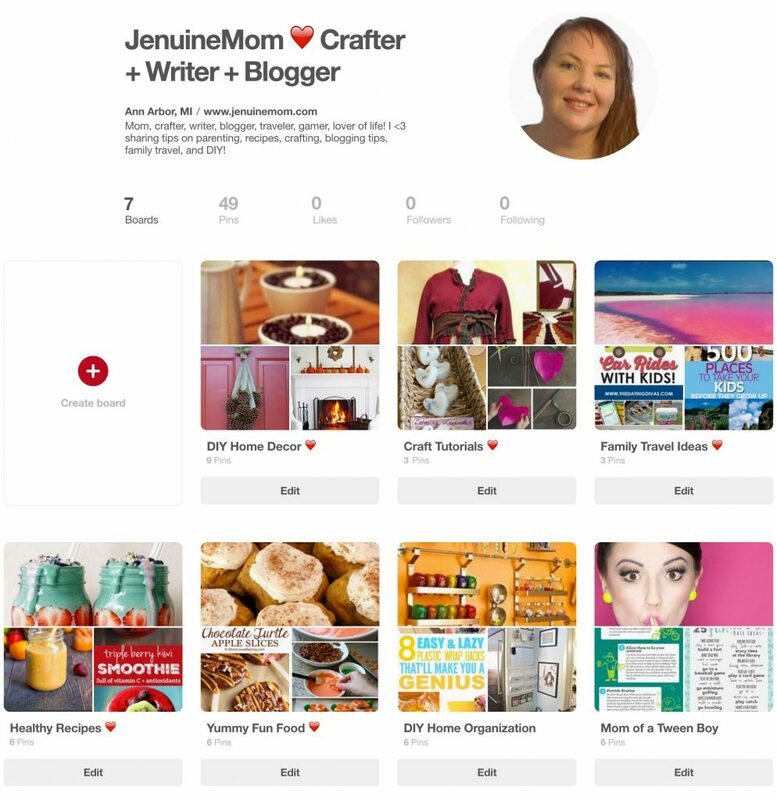 Here’s what my Pinterest account looks like on day 7! How many Pinterest Followers Do I Need? At this point, you may be wondering how many Pinterest followers you really need. I think it really depends on what you’re hoping to accomplish. Me? I am aiming for more than my business account (5k) because my topic (diy home, recipes, and parenting) are among the top search words on Pinterest unlike my business account’s topic (travel). But you may not really need to have hundreds of thousands—check out this blog post from Pinterest on why you don’t need as many followers as you think. 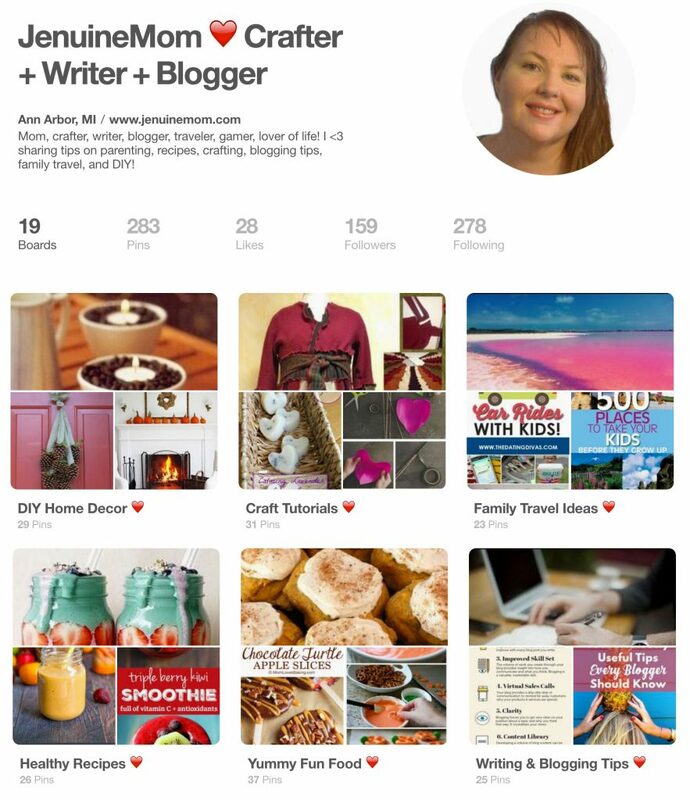 What are your tips for gaining followers on Pinterest? How long did it take you to get your first 100, or 1000?